Caroline is a mostly rural county north of Richmond. It has a population of 30,461 and is one of the largest counties in the region in terms of land mass, covering 539 square miles. 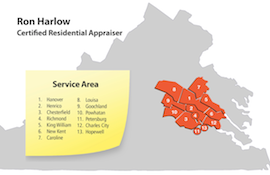 Caroline has the largest percentage of foreclosures and short sales in the Central Virginia area, primarily due to the influence on the northern part of the county by the Fredericksburg market. Interesting trivia: Caroline is the birthplace of Secretariat, winner of the Triple Crown in 1973.